This May I again had the wonderful opportunity to represent Birding Ecotours at The Biggest Week in American Birding (BWIAB). The BWIAB is a 10-day long event situated on the beautiful shoreline of Lake Eire in Northern Ohio. This was my second visit to this festival, the first being in 2015 and so I was full of excitement at the prospect of some good migration birding, catching up with many friends from my previous trip, and meeting many new people to talk to about our fantastic range of worldwide birding tours. I was also excited at the prospect of getting a few year ticks to go towards my 2017 tally! 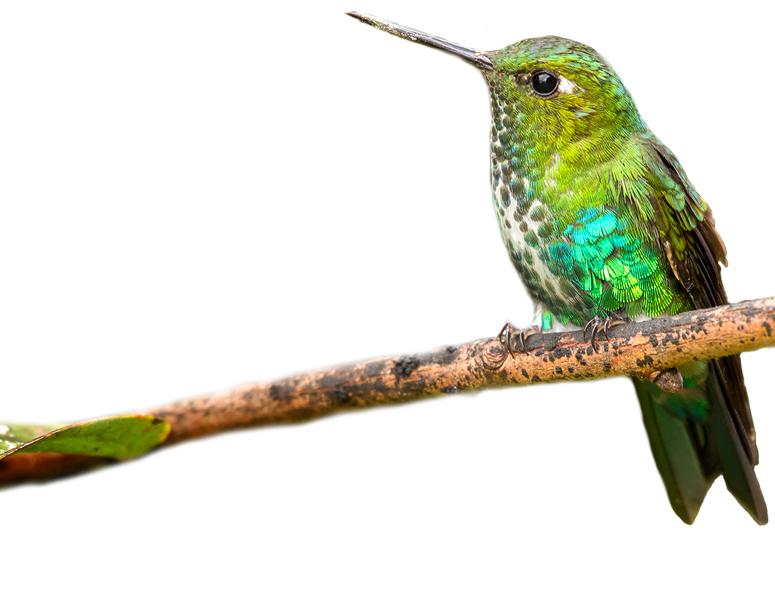 I happened to be in the ‘New World’ just before BWIAB having led a tour of Costa Rica, and a scouting trip to Colombia so I had been watching many of the migrants in their wintering grounds, and those starting their northbound migration for the preceding couple of months. On arrival into Ohio I met up with Chris Lotz Birding Ecotours owner, and his wife Megan and explored the Columbus area, their new home base and location of the new Birding Ecotours US office! It was clear there was passage underway with several birds noted immediately on arrival such as Indigo Bunting, Northern Parula, and Yellow-rumped Warbler. A short trip out at dinner time gave us very nice view of a Barred Owl. American Yellow Warbler was one of the commonest warblers seen during the Biggest Week. The weather didn’t let up and on Day 1 of the BWIAB I took an adventurous group of intrepid birders out along the lake shore and got suitably wet, and freezing cold. Birding was slow, as to be expected in these conditions but we did see Yellow, Palm, and Yellow-rumped Warblers, Grey Catbird, and Baltimore Oriole amongst a range of much more common resident species such as Great Horned Owl, Red-headed Woodpecker, and Brown Thrasher. 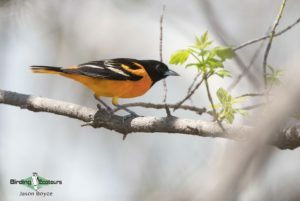 Baltimore Orioles were seen in good numbers throughout the week. Over the course of the next few days the weather improved slightly and our colleague Dylan Vasapolli arrived from Johannesburg. You can read Dylan’s thoughts on this years’ BWIAB here: (https://fatbirder.com/announcements/index.php?article=174). We got to birding around the world-famous Magee Marsh boardwalk and surrounds gradually picking off migrants one by one. Species were fairly plentiful but quantity was just not there, warblers included: Palm, Nashville, Orange-crowned, Prothonotary, Black-throated Green, Black-throated Blue, Black-and-white, Yellow-rumped, Magnolia, and Pine Warblers, Ovenbird, and American Redstart, with Blue-headed, Warbling, and Red-eyed Vireos also present. Blue Jays were a dominant sight, with hundreds upon hundreds of them passing through over these days. Two pairs of nesting Bald Eagles provided ample entertainment when the migrants were quiet. As expected the huge amounts of water started attracting interesting shorebirds and gulls and as we were driving around we found several Bonaparte’s Gulls, Wilson’s Phalarope, White-rumped Sandpiper, Long-billed Dowitcher, and Pectoral Sandpiper. Chris and I were in the right place at the right time when a Nelson’s Sparrow was reported. We were literally 50m away from it when news came out and so rushed straight over as that would have been a lifer for Chris, and a surprise year-tick for me! However, on arrival it was clear that the bird was in fact a Le Conte’s Sparrow – much scarcer in the local area at that time of the year, and an unexpected lifer for me, but not for Chris! 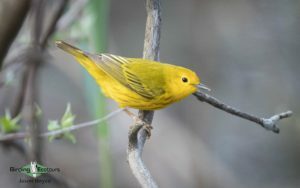 This beautiful Wilson’s Warbler was one of the scarcer migrants at Magee Marsh. Over the course of the BWIAB we all led various van trips and guided walks, and I gave a talk on Birding in Australia – for those who wanted to escape the Ohio cold and dream of more colourful and exotic birds in a far-flung place! 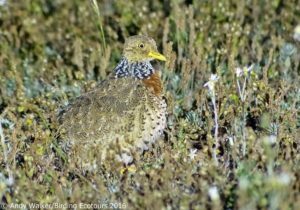 Possibly the first Plains-wanderer to have featured at the Biggest Week in American Birding! By the end of the festival (about 4 days out) the migration really started to kick off with a noticeable increase in terms of both species diversity and quantity and this was where things started to get exciting. 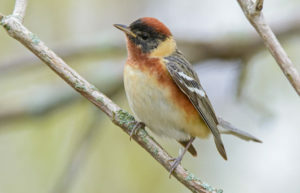 This sudden arrival of birds was brought about by the movement of a blocking weather system that had been directing birds to the east and the west of us, as is the way with migration birding – a lot is down to luck! Our first real hit of activity occurred when we were at the wonderful Pearson Metropark. Here, on getting out of the car is was immediately clear ‘it was on’! A vociferous Northern Parula was serenading anything that would listed and it seemed to be the focal point of activity over the next couple of hours with an assortment of warblers (including the stunning Blackburnain and Chestnut-sided Warblers) present but moving very quickly through the canopy. More obliging was the flock of Scarlet Tanagers and Rose-breasted Grosbeak that loitered a short while.  A Hermit Thrush was hopping about on the lawn right in plain sight but a cuckoo species didn’t play ball and frustratingly went unidentified as it cleared off all too quickly before any of us could really get anything on it. On our last full morning birding together – the Saturday, we headed out to Oak Openings in the hope of finding some special birds, and the morning far exceeded even our high hopes – we got staggering views of Prairie Warbler, soon followed by Yellow-breasted Chat (a lifer for Dylan and myself), and a stonking Kentucky Warbler in the same bush – with Blue-winged Warbler singing overhead! As we headed back to Maumee Bay we stopped off to admire a very smart male Bobolink and a Sora walking about out in the open! The area around Maumee Bay was fully loaded with Ovenbirds, along with Veery, Swainson’s and Wood Thrushes and it was hard not to trip over them at times! Spectacular sight. The final morning of the BWIAB, Sunday was one of the best. The weather had delivered the birds. Chris and I were leading a tour around the Pearson Metropark (my new favourite spot in Ohio!) and the place was dripping in warblers – it took us almost 2 hours just to get out of the car park! Swainson’s Thrushes were everywhere but the warblers took some beating – Blackburnian, Magnolia, Yellow, Cape May, Black-throated Green, Black-throated Blue, Chestnut-sided, Nashville, and Tennessee Warblers, American Redstart, Northern Parula etc. Blue-headed Vireos were showing down to a matter of a few feet and there was Indigo Buntings, Rose-breasted Grosbeaks and Scarlet Tanagers pouring through. However, once we got out of the car park into the forest it was clear there were birds everywhere! 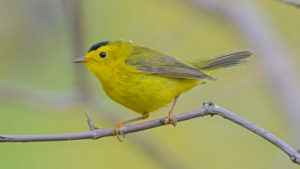 Connecticut Warbler was the star bird and was seen briefly (I’d only heard this species back in 2015), more showy were Canada, Wilson’s, and Mourning Warblers, as was Grey-cheeked Thrush, and Black-billed Cuckoo. Finally Bay-breasted Warblers and Blackpoll Warblers were also ‘in’, but in small numbers really, certainly compared to 2015. I was just relieved not to have missed them altogether as was looking likely as each day passed by. Bay-breasted Warbler was one of the last migrant warblers to arrive. On the final afternoon we all got together to have a quick look at Magee Marsh boardwalk for the final time adding several more warblers to our already impressive day list – such as Prairie, Prothonotary, and Golden-winged Warblers. It was a fitting end to what had ended up being another really enjoyable weeks birding in Ohio. On the drive back to Columbus we had a small flock of Cedar Waxwings flying across the road – surprisingly our first of the trip. The BWIAB 2017 was totally different from 2015, and is likely to be totally different to 2018 if I’m lucky enough to be there! That’s all down to the vagaries of migration birding, and what makes it such a fun and frustrating thing – often in the same day! It was great to catch up with old friends, and make new ones and spend hour upon hour talking all things ‘bird’ and ‘birding’. I offer a huge thank you to everyone at Black Swamp Bird Observatory and Maumee Bay Lodge for making the event the huge success it undoubtedly was, and is, and to Chris and Dylan for their great birding and being great companions again! Until the next time…. 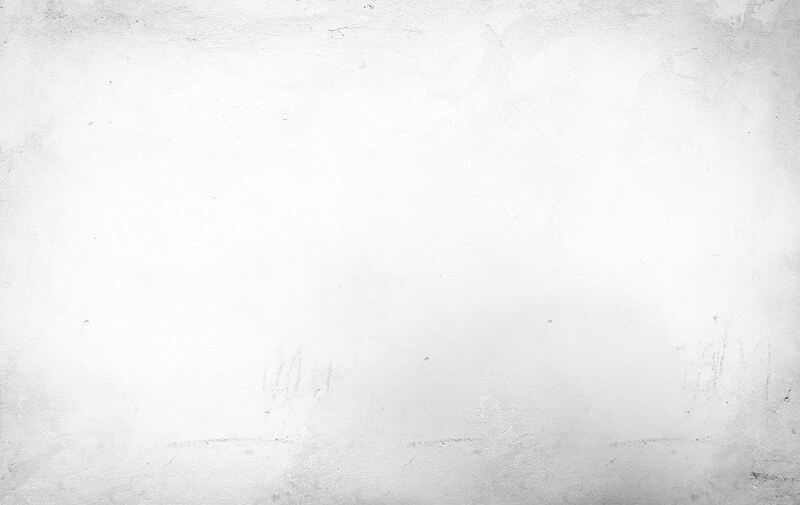 Andy.